Chicken pox (also called varicella) is a classically childhood skin disease that is caused by the varicella zoster virus, the same virus that causes shingles in adults. It causes a self-limiting rash composed of vesicles (small fluids filled blisters) all over the skin. These lesions progress from a reddened raised area to a small blister/vesicle and finally to a crust when the blister breaks. A classic sign that confirms that a skin infection is, in fact, chicken pox is the presence of multiple lesions in various stages of progression (for example, older lesion will appear as a crust next to newer lesion which appear as red bumps). Aside from the rash, signs and symptoms of chicken pox include a mild fever, a headache, and malaise – a word here which means just generally feeling unwell (this word is also used to describe how you feel when suffering from the flu). This disease is generally well tolerated and not dangerous. 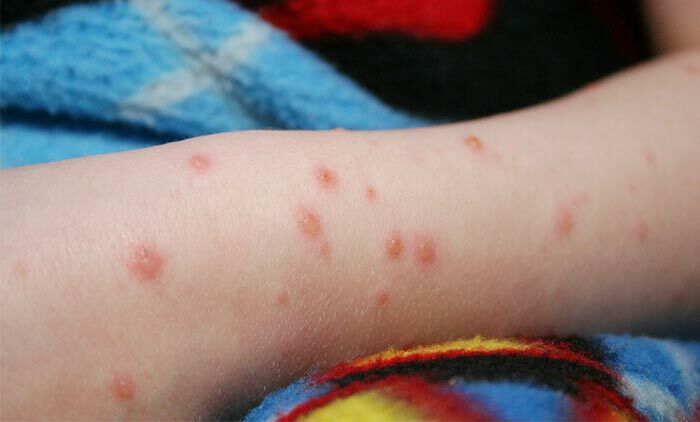 The worst complication occurs when the rash is scratched excessively which can damage the skin and leave the child susceptible to secondary bacterial infections. NEVER give a child with chicken pox aspirin. This can lead to the deadly reye’s syndrome. Instead, treatment is aimed at reducing the discomfort caused by this virus and the use of antiviral medication to potentially reduce the duration of the disease. It will, however, usually resolve on its own without intervention. This disease is highly contagious, and in fact those who are infected can spread the disease for multiple days before symptoms begin. In children this virus causes a relatively mild illness and confers life-long immunity, but in adults it can cause a life threatening disease. This is especially true for pregnant women who have never been exposed to the virus before as a first time varicella infection during pregnancy can lead to birth defects in the child. Furthermore, the virus is never completely cleared from the body – it remains dormant in nerve cells and can reactivate decades later to cause a disease known as shingles. Shingles is usually triggered by some kind of stressor; disease, emotional stress, or immunosuppression. While chiecken pox is typically a well-tolerated disease, it is still best to be evaluated by a physician. If you or your child is displaying symptoms of chicken pox please schedule an appointment with your dermatologist for evaluation and treatment. Dr. Jochen specializes in Mohs Surgery for skin cancer removal, facial rejuvenation including cosmetic laser technology, Botox® and facial fillers, soft tissue augmentation, leg and facial vein treatment, tumescent liposuction and hair restoration/transplants.